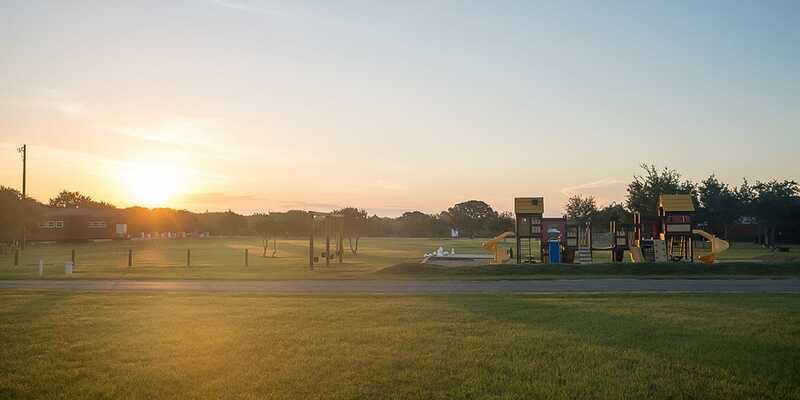 We do allow early check-in and late check-out at no additional charge for RV and tent sites. Simply check with guest service for more information. Do you offer weekly and monthly rates? We do not offer weekly rates, but we do offer monthly rates. Please speak with a member of guest service if you are interested in a long term stay with us. We do have restrooms located in the middle of Section A, near Section B, and near the tent sites in the campgrounds. Please refer to the Campground Map for further detail. Do you allow pets at the campgrounds? We do allow pets at the campgrounds. Pets must be on a leash at all times and should not be left unsupervised. Pets are not allowed at the waterpark. 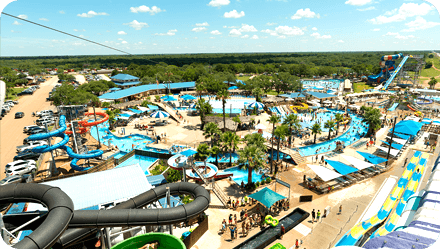 If we are camping at the RV Park is admission to the Waterpark included? The Campground pricing is separate than that of the waterpark. You can prepurchase waterpark tickets online or purchase tickets at the waterpark admission booth once you arrive. How far in advance do I need to make a campground reservation? It is recommended that reservations be made as soon as possible. The weekends tend to fill fast as a limited number of reservations are taken daily. All reservations are done on a first come, first serve basis. All reservations require payment in full with credit card. Please see our cancellation guidelines for complete details. Do you charge per person for the RV park? We do not have a per person charge for the campgrounds. Do you offer any type of discount for campers? 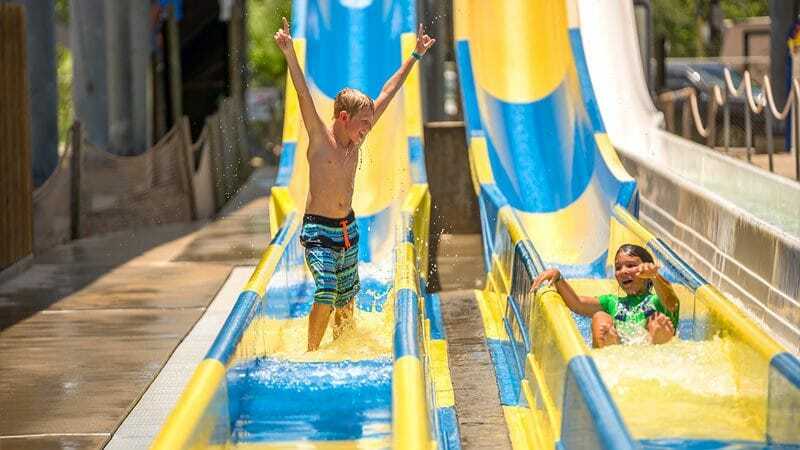 Splashway offers a 10% discount for current season pass holders on camping reservations. What happens if there is bad weather and we can not camp? If a cancellation is made due to expected harsh conditions in OUR area, you will receive a bad weather voucher valid for the season in which it is issued. This voucher will be good only at Splashway Waterpark & RV Park and will have NO cash value. Will my reservation request guarantee a specific site or that I will get a reservation? A reservation request does not guarantee a site or a reservation. A member of guest service will contact you to complete your request once your request has been received. We do not currently offer WIFI, but are working toward offering it in the future. Are there any hotel/motel accommodations nearby? Splashway is located in the rural community of Sheridan, TX. The nearest hotel accommodations are located 20 minutes away in both Hallettsville and Columbus. 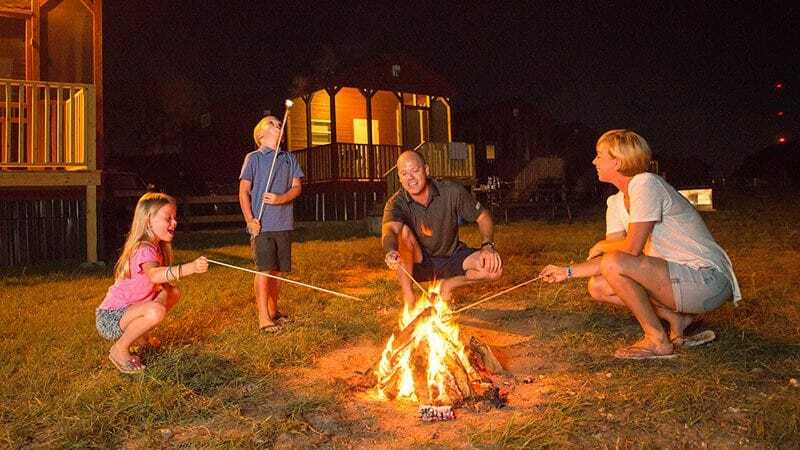 We do, however, have an RV Park and Campgrounds that welcomes any guests wishing to tent camp, bring their own RV, or rent one of our cabins or cottages. 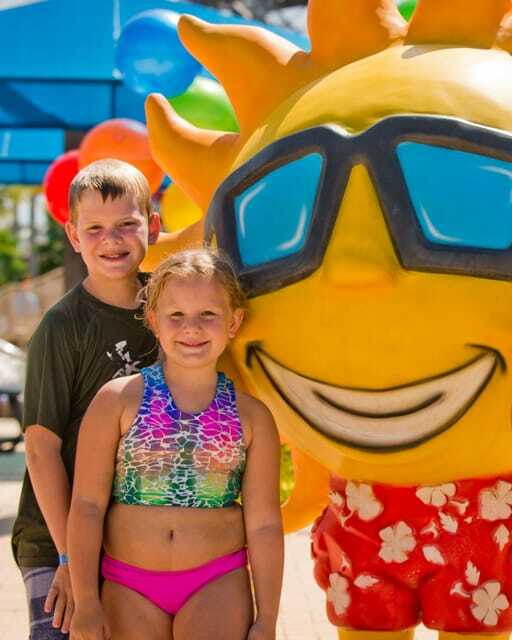 What might our family do in addition to visiting the waterpark? Splashway Campgrounds includes several walking trails, hiking, and biking along with a large pond for catch and release fishing. You may also enjoy your time bird watching, playing baseball, kickball, volleyball or throwing horseshoes and washers. We also have paddle boards, pedal boats, and kayaks that may be rented! If you plan to visit neighboring towns, click on one of the following links to check out the Chamber of Commerce websites for the 4 nearest towns. We do allow campfires as long as we are not under any sort of burn ban and the weather permits. Please do not leave campfires unattended at any time. Didn’t find the answer to your questions? Contact Us! Make sure your RUV is allowed at Splashway Campground. Recreational vehicles that fall under the acceptable category are allowed on premises with restrictions. Vehicles in this category are generally gas/diesel powered utility style and not equipped with modified exhaust causing an unreasonable level of noise. Splashway management reserves the right to decide what qualifies as an unreasonable level of noise. We ask that speed limits are always kept under 5 mph and the vehicle is kept in low gear for operating at a safe speed. Vehicles that fall in the acceptable category must be parked at your campsite for the evening by 10:00 pm. Recreational vehicles in the “not allowed” category are typically lifted with oversized tires. Due to the height of these vehicles, it makes it unsafe to navigate through our campgrounds. These vehicles typically have modified exhaust that makes it hard for families to enjoy our peaceful campground. We ask that you do not bring any vehicles that would fall under the not allowed category. If you do bring a vehicle in this category you will not be allowed to take it off the trailer. A good rule of thumb: If you have a vehicle with after-market modifications and are worried you may fall into the not allowed category, please feel free to call ahead or email pictures. We will be happy to save you the effort of hauling it out. 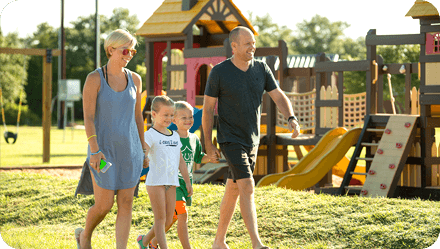 Splashway strives to provide a Clean, Safe and Family-Friendly atmosphere. 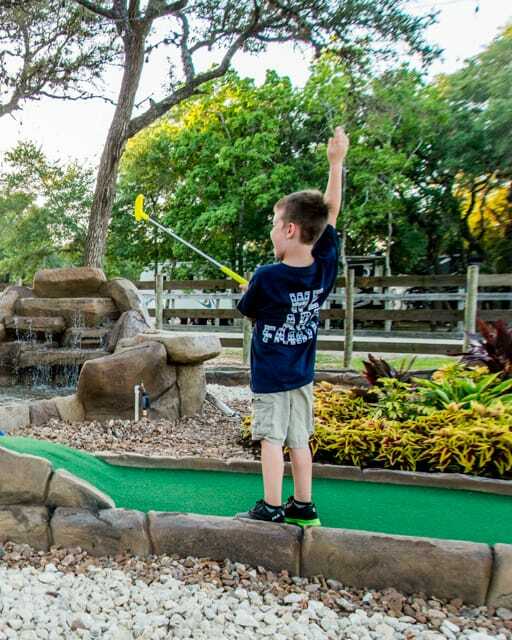 While we do allow our guests to bring their golf carts and some recreational vehicles we do ask that those vehicles do not take away from the family-friendly atmosphere. Music should be kept to a reasonable level. Modified sound systems are not allowed. If your neighbor can hear your music, then chances are it is too loud. We ask that any vehicles with LED lights or light bars, please refrain from using them as it makes it hard for other guests to navigate safely throughout the campgrounds. We also ask that any vehicles with modified exhaust or enhanced engines that create an unreasonable level of noise, please be kept at home. The following rules are in place so that all visitors may enjoy their stay. We ask that if you are interested in staying at Splashway Campground, that you please read and pay special attention to the following information. Happy and Safe Camping to you all. We are not strict people. We love to have a great time. However, we are FAIR and FAITHFUL. We live by the golden rule: “Do unto others as you would have them do unto you.” – Luke 6:31. Translation: Respect your neighbors and we will all have a great time. 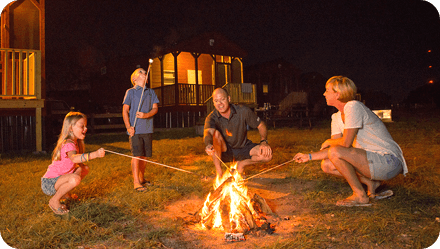 Please note there is a 3-night minimum for holidays for all cabin, cottage, RV, and tent site reservations. Please note that for weekends there is a 2-night minimum stay for RV Sites. Motorcycles, 3 Wheelers, 4 Wheelers, dirt bikes & go carts are not allowed to be driven in the park area. Management reserves the right to ban any vehicles deemed dangerous, hazardous, or an annoyance to any guests. Do not cut down or deface any tree or branches in the park. Do not exceed 5 MPH in the park for any reason. A maximum of 1 vehicle per site. Additional cars are to be parked in the overflow parking lot near the information center. No hunting of any kind is allowed! Music should be played at a comfortable volume as to not disrupt others who are camping. No cruising! Please keep driving to a minimum. 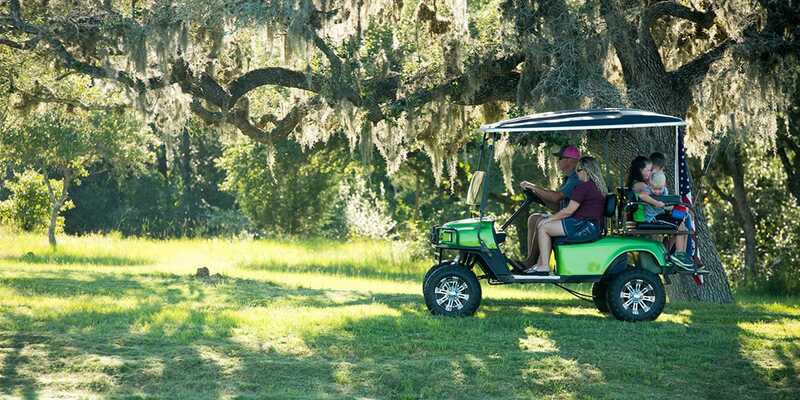 Some golf carts, mules and other small Recreational vehicles are permitted if they meet the requirements in our Recreational Vehicle Policy. They should be operated by a responsible adult and must have a steering wheel. Recreational vehicles with loud mufflers or engines are not permitted to run after 10pm. No vehicles are allowed on hiking trails or bridges meant for pedestrian use. Check-Out time is 2pm. Check-In time is 3pm for RV and tent sites. Check-Out time is 11am. Check-In time is 3pm for cabins and cottages. Alcohol is allowed as per State of Texas Laws. 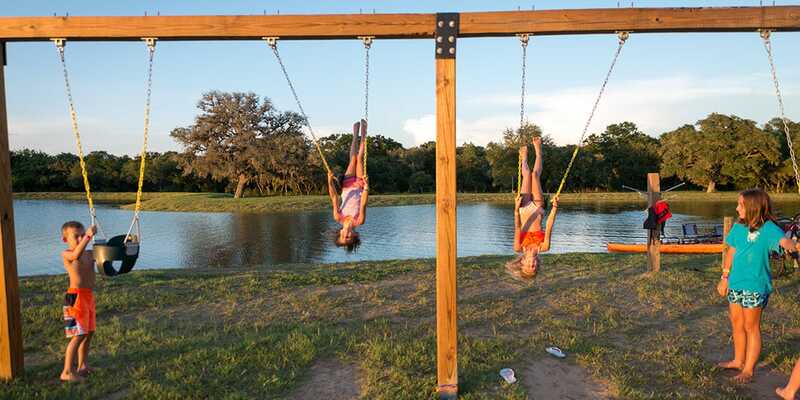 Anyone drinking under the age of 21 or guests disturbing the peace of other campers will be escorted from the park and may face further penalty. This is a family park! Please watch your children and pets. You are responsible for their behavior. Pets should be on a leash at all times. Children should be supervised at all times. 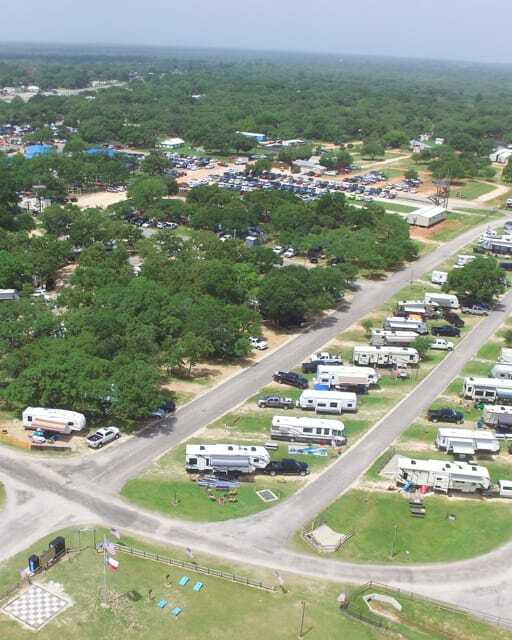 Welcome to Splashway RV Park and Campground in Sheridan, Texas and welcome to the woods! By camping with us you understand the “nature” of camping. We do not control the weather, the animals, the trees, the insects or anything else in the wild. Splashway is not responsible for any accidents, injuries, or damages to you or your possessions due to nature. In addition, we are not responsible for lost or stolen items. It is important to take care of yourself, your family, and your belongings. Camp responsibly. While we do our best to accommodate you and maintain a beautiful park you must keep in mind that YOU ARE CAMPING and with it comes the beauty of God’s creations. On occasion, those creations can be a bit pesky. Simply, let us know and we will do all that we can to make your stay comfortable. We do allow booking up to one year in advance from the day you are booking the reservation. Please note that the guest that is staying in a particular site for the future date you are requesting has first choice until the end of their stay. For example if you are booking on July 3rd you can book a reservation as far in advance as July 3rd of the next year. However, if there is a customer already booked in the site you want for the future this year, they will have first choice on that site for a future reservation on the same date. They have until the end of their current stay to re-book their site. Cancellations or rebookings made less than four weeks prior to the start of your reservation will incur a cancellation or re-booking fee of $25. 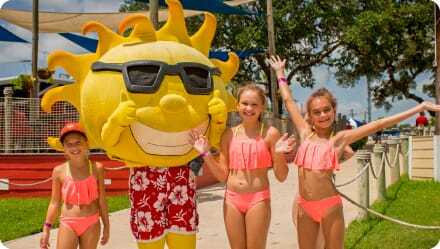 Cancellations made four weeks prior to the reservation start date will receive a full refund of the entire payment made at the time the reservation was taken. Cancellations made less than four weeks prior to the reservation start date will receive a full refund minus a $25 cancellation fee. Cancellations made 1 week prior to the reservation start date will be refunded 50% of payment made. You will be refunded on a Splashway gift card. Cancellations made less than seventy-two hours prior to the reservation date will forfeit all money paid. In addition, “No Shows” will be charge a $25 fee.